Labels with reverse-side printing are printed not only on the front but also on the adhesive side. The single or multi-coloured print of the motif is carried out directly into the adhesive on the back of the label roll and is visible after applying the label through each transparent surface. Please choose the type of tactile warning triangle. 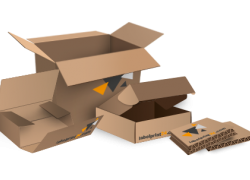 DISCOVER PACKAGING INSERTS: Click here - We offer plano and pre-folded packaging inserts for your product packaging. For labelling products with transparent surfaces, the reverse side with adhesive can also be printed in addition to the front side. The advantage of labels with reverse-side printing is the additional information and advertising surface it creates, an advantage normally only available with multi-layer labels. Due to the single-layer production, labels with reverse-side printing can be less expensive to produce than sandwich or booklet labels. However, they are only two-sided, so they are still rather limited in space. Labels with reverse-side printing are used, for example, to communicate additional product information on transparent bottles or on containers re filled with transparent liquid or film. Typical examples would be high-quality bottles for mineral water or spirits. If the glass bottles are ground with a magnifying effect at the point where the label is attached, it can even create a 3-D effect. Other â€‹â€‹applications would include providing text in multiple languages, operating instructions, warnings, or other textual information without having to give up an appealing promotional design on the front side of the label.